Manager Nigel Clough believes Burton's historic Carabao Cup run is helping to lift the gloom of last season's relegation. 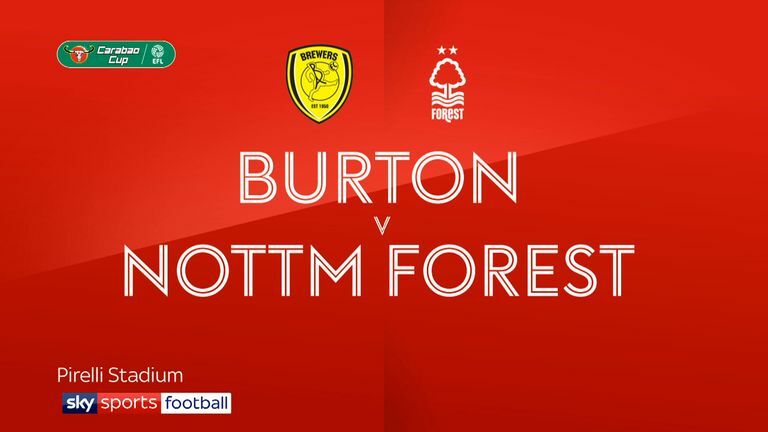 Clough masterminded a 3-2 victory over his old club Nottingham Forest to send the Brewers into the Carabao Cup quarter-finals for the first time in the club's 10 years as a Football League club. "It was history to get to the last 16 and now we have gone a step further and we are really looking forward to the quarter-final draw now," said the former Forest striker, who won the trophy twice as a player under his father Brian's management. "It's wonderful for everyone here at Burton to enjoy it, especially after dropping out of the Championship last season." Albion had already knocked out Aston Villa and Premier League side Burnley at the Pirelli Stadium and proved to be more than a match for their East Midlands rivals. After a goalless first half, Scott Fraser saw a shot deflect in off defender Saidy Janko before drilling home a superb second. Forest substitute Lewis Grabban halved the arrears with 20 minutes to go but Southampton loanee Jake Hesketh's superb volley ensured Albion's place in the last eight despite another Forest substitute, Arvin Appiah, scoring in added time. "It was a great cup tie," Clough continued. "End-to-end stuff, although we created a lot of chances in the first half but couldn't finish them. "A good game and just so pleased that we came out of it with the right result in the end." Albion even got over missing a first-half penalty when Liam Boyce blasted over after Liam Bridcutt had brought down Jamie Allen in the box on the half-hour. "When you come in at half-time and could be two or three up, we just told the players not to regret it," said Clough. "Don't let the second half be about what might have been, and we went out there and created more chances but this time we got our rewards." Forest boss Aitor Karanka struggled to contain his anger after seeing his side pass up the opportunity to make it to the quarter-finals for the first time in a quarter of a century. "I am angry, a lot," the Spaniard began. "We were poor tonight. We had a really good opportunity to do something nice in getting to the next round after 25 years. These are the sort of games that as a player you look back on as a lost opportunity. "I feel embarrassed, I feel bad because a team that is in League One and has played four games in the last 10 days with mainly the same players were much better than us. "They were much stronger than us and wanted every single ball more than us. They had hunger and intensity, much more than us. "I can't understand it and I need to analyse it. I feel so sorry for the crowd because everyone came here tonight knowing that we had a really good chance to do something nice and we did nothing."